The All India Congress Committee met at Wardha, Bombay on 8th August, 1942. It passed the famous Quit India resolution and proposed to start of a non-violent mass struggle under Gandhi’s leadership. It is also called Vardha proposal and leaderless revolt. Gandhi told the British to quit and leave India in God’s hand. His message was Do or Die. 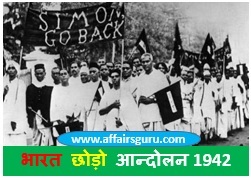 2 Why was Quit India Movement, 1942 happen? 4 Why Quit India Movement Failed? Repressive policy of the government and indiscriminate arrest of the leaders provoked people to violence. Nehru was lodged in Almora jail, Maulana Azad in Bankura and Gandhi was kept in Agha Khan’s place, Poona. In many areas, government lost control and the people established Swaraj. Parallel governments were established in some place. Balia, U.P (by Chittu Pandeya) – first Parallel govt. Tamulak, Midnapur Distt., Bengal (by Satis Samant). Satara, Maharashtra (by Y.B. Chahvan and Nana Patil) – the longest term parallel govt. Underground revolutionary activity also started by Jaiprakash Narain and Ramanandan Mishra escaped from Hazirabagh Jail and organised an underground movement. In Bombay, the socialist leaders continued their underground activities under leaders like Aruna Asaf Ali. Congress radio was established with Usha Mehta as its announcer and Rammanohar Lohia in Bihar. School and college students and women actively participated, workers went on strikes. The merchant community and capitalist did not participate. Muslim League kept aloof and the Hindu Mahasabha condemned the movement. Communist party did not support the movement. Rajagopalchari also did not participate. This mission taken place in March to August 1942. In 1942, the British Government realized that it could not ignore the Indian problems any more. As a result of the World War, the situation worsened for the British with Japanese advance towards Indian borders. By March 7, 1942, Rangoon fell and Japan occupied the entire South-East Asia. The British government, with a view of getting cooperation from Indians sent by Sir Stafford Cripps, a member of the British cabinet to India settle terms with Indian leaders who were forthwith released. Cripps proposed Dominion Status after the war but his proposal was rejected by all the political leaders. As no party agreed to accepts these proposals, the Cripps Mission ended in failure. Why was Quit India Movement, 1942 happen? Japan was advancing towards India and the fall of India to Japan was imminent. Gandhi ji warned that only a free India could defend herself and her urged for the rights of self-determination to Indians. Rise of Prices of Commodities due to World War 2. Why Quit India Movement Failed? The quit India was not supported by the Muslim League and the Communists. Major leaders of Congress was arrested by British including Gandhi ji. Jinnah and the Muslim League, as well as Congress opponents like the Rashtriya Swayamsevak Sangh and the Hindu Mahasabha sought to gain political mileage, criticizing Gandhi and Congress Party. Lack of co-ordination among the congress people agitating in different parts of the country. There was absence of a clear cut programme action. It was confined only to students, peasants and lower middle class. But the upper middle class had lost their faith in the Gandhian methods of action.Regarding the Cripps Mission proposals Mahatma Gandhi remarks ‘A post-dated cheque on a crumbling bank’.